A lifelong horse lover, Kim McElroy portrays the inspiring emotional, spiritual, and dynamic presence of these magnificent creatures. At times she portrays horses as ethereal spirits, symbolically blended with the forces of nature, while her more realistic portraits capture the emotional impressions these beings inspire in those who admire them. Through her incredible mastery of pastels, and her talent in writing about her artistic insights, Kim McElroy conveys the power and beauty of the horse’s form… yet more than that, she offers us a timeless glimpse of its soul. In her artwork Kim seeks to express the elements of the horse’s spirit in a quest to awaken humanity to their healing gifts. Kim’s portraits are in high demand because her works have a life of their own. Kim’s styles range from tangible portraits, to her Soul Essence portraits – which are created from a meditation in which she engages with the spirit of the horse to reveal symbolic images that express their true selves and in some cases, their purpose in their person’s life. Kim’s artwork and interview are featured in the Path of the Horse. She is the co-creator of the book and card set Way of the Horse –Equine Archetypes for Self Discovery, created in collaboration with author and Epona founder Linda Kohanov. 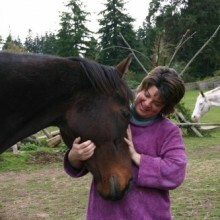 Kim also is the author and illustrator of the Way of the Horse Journal, a guided journal for horse inspired writing and drawing. Kim’s website Spirit of Horse Gallery ~ features over 300 of her creations as fine art prints and unique gifts,books, and journals. Kim’s new eCards website – Spirit of Horse Cards – features unique and inspiring flash movies of her artwork and writings choreographed to the delightful music of Vicki Logan.